Back in the day, I wanted to be an archeologist … not the folks finding dinosaurs and bones, but the ones on a dig who sifted through the local “dump” and could determine how ancient people lived by studying their “trash.” That’s why I was fascinated by an online article about University of Pennsylvania professor, expert in ancient alcohol and “archeochemist” Patrick McGovern, who is recognized as a pioneer in the emerging field of biomolecular archeology. These biomolecular guys don’t just study physical artifacts. They can, for instance, analyze residues contained in jars — specifically wine jugs, even though the contents have long since evaporated. And that brings us to the meat of the article. Dr. McGovern’s team applied their cutting-edge techniques to investigate the medicinal properties in the earliest-known Chinese and Egyptian alcholic beverage residues. The world’s first physicians mixed organic materials with healing properties into wine. 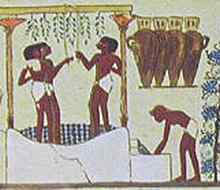 The ancient Egyptians, famous for medical knowledge and the use of organic products as treatments, turned wine into medicine by adding herbs known to treat disease and improve health. A wine jar from the tomb of one of the first pharaohs, Scorpion I, was found to be steeped with herbs including balm, coriander, mint and sage, as well as pine tree resin. The goal of Dr. McGovern’s research was to look for anti-cancer and other medicinal benefits and determine if any of the “lost” ancient natural wine remedies might be useful today. Last year, the “Archeological Oncology” team confirmed that several compounds showed promising and positive test tube activity against lung and colon cancers. The next stage, testing of these compounds against lung cancer in an animal model, is being planned. Just think, we have millenia-old wine residues to thank for contributing to the knowledge of modern medicine.